Bubble wrap provides low cost protection for all items and packing. Whether in transport or storage, bubble wrap will shape to fit the product that it is wrapped around ensuring the item is protected at all times from surface damage and movement. The lightweight material ensures that little weight is added to your packages reducing overall delivery costs. Bubble wrap is also a great low cost void fill solution providing internal cushioning and security to packaged items. 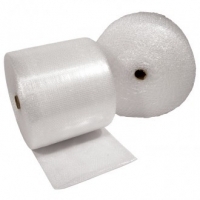 We stock a range of small bubble, large bubble, small bubble sheets, bubble bags and biodegradable bubble rolls. Small bubble wrap is suitable for smaller, fragile items while large bubble wrap provides excellent protection for shipping larger objects like furniture or other simple shaped items. Both bubble grades are suitable for use as a void fill solution.